The Westone Cable Ear Guides are made from soft and flexible silicone, allowing the wearer to enjoy an improved over-the-ear fit that reduces cable noise and keeps their in-ear monitors and earphones in place. Over twenty years ago, Westone changed the way music is performed with the introduction of the world's first universal-fit balanced-armature in-ear musicians' monitors. Every accessory we manufacturer meets the highest standards in the industry and is designed to improve your listening experience. KEEP EARPHONES IN PLACE: Created to help keep over-ear cables in place, the Westone Cable Ear Guides provide an extra measure of rigidity and thickness to your cables near the ear so that your IEM stay in place. REDUCE CABLE NOISE: These cable ear guides also help reduce cable noise and hold your IEM cables in place over your ear. The increased stability of your cables will decrease cable noise in your earphones. IMPROVED OVER EAR FIT: Many IEM users need a more rigid fit to their over the ear cables so that they will stay in place. These cable guides allow for cables to stay in place while you move and improve the comfort of your earphone cables. MADE FROM SOFT & FLEXIBLE SILICONE: The perfect complement to your IEM cables that go over your ear, the flexible and soft silicone material of these cable guides is very comfortable and can be worn for hours on end. 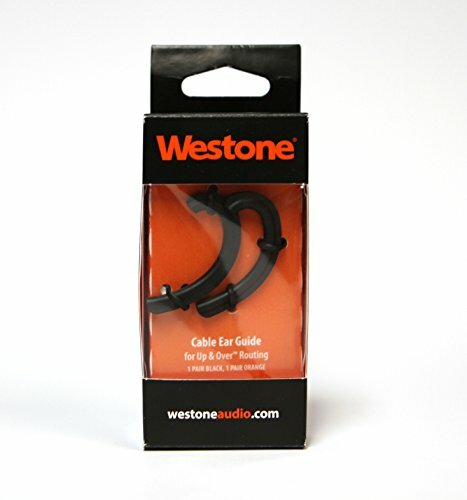 INCLUDED WITH PURCHASE: Two pairs of Westone Cable Ear Guides; one pair of black guides and one pair of orange guides. Compatible with all Westone IEM cables and many other brands of IEM cables. If you have any questions about this product by Westone, contact us by completing and submitting the form below. If you are looking for a specif part number, please include it with your message.